There's lots to love about these unique animals! 1. They're hardy and healthy. Domesticated in the peruvian Andes, llamas are very hardy and can withstand both heat and cold. Given good living conditions, ample pasturage and the companionship of other llamas, they thrive in an amazing range of climates. They're also disease-resistant. 2. They have an excellent disposition. Llamas are gentle, curious, calm, and social. They interact well with both people and other animals, and they don't generally get upset by new situations. 3. They're intelligent and easily trained. Llamas are extremely bright and learn quickly. They can easily be halter trained and taught to pull a cart, and they can even serve as "guard animals", protecting flocks of small livestock. 4. They're easy to care for. 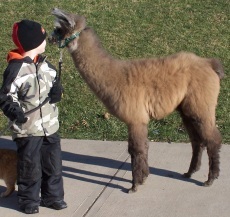 Llamas don't have difficult diet or shelter requirements and they require very little equipment. Aside from routine worming and vaccinations, they generally require an absolute minimum of veterinary attention. 5. They get along well with each other and with other animals. 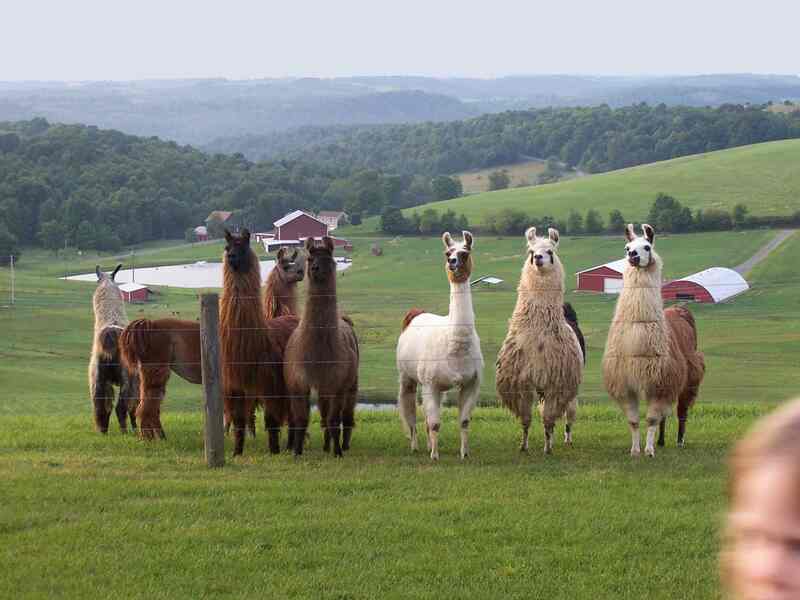 Llamas are very social animals and need to be with other llamas. They're also quite compatible with other domesticated animals and may even bond with sheep or goats, driving predators away from the herd. 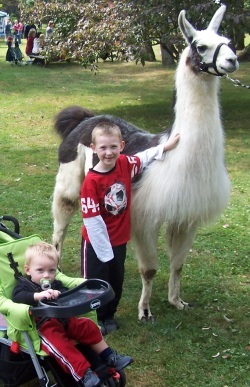 Llamas are unparalleled trail animals, capable of carrying up to 80 pounds in a pack. Llamas are also anjoying an increasing acceptance as "guard animals", protecting sheep and other small livestock from predators. 7. They're very discreet about "bathroom" habits. Llama droppings are small, nearly odorless pellets (similar to deer droppings) and are generally deposited in a communal dung pile, which makes for easy cleanup. Llama droppings make excellent fertilizer for flower beds and gardens. 8. They have great wool. Llama wool finds great favor with home spinners for making sweaters, scarves,and other wearing apparel. 9. They're inexpensive to maintain. 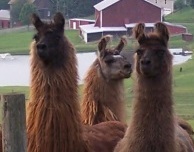 With good pasture, it can cost less than $300 per year to keep a llama. 10. They're quiet and peaceful ... and they hum. Llamas are quiet and pleasant to be around, but they make a variety of interesting noises to communicate and they frequently hum. 11. Every one has a unique personality. 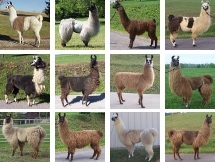 Llamas can be playful or placid, affectionate or aloof, cooperative or full of pranks. Each one is an individual. 12. They get along well with children, they don't bite ...and they're funny. Llamas are quiet and docile and generally very careful about bumping into or stepping on people or other animals, and their placid disposition makes them quite calm when the unexpected occurs (as it often will with children!). In addition, llamas have no upper front teeth, so biting isn't one of their usual behaviors. And if you've never watched a llama take a sunbath or have a nice relaxing roll in the dirt, you've got plenty of smiles ahead.